I have a short film shoot coming up soon that's becoming quite a challenge. I've attached a rough floor plan for reference. Hopefully, soon I'll be able to go in and get actual measurements of the room. Basically, the scene is about a couple in their bedroom at night. The director wants a warm, somewhat dim look. The scene from Sicario when Jon Bernthal's character attacks Emily Blunt comes to mind, though far less of a silhouette. We'll be doing some tests later this week and possibly rearranging some furniture, but this is what I know so far: The scene must be done in one continuous take, meaning I will have to follow the actors as they move around the room from the vantage point of the camera near the corner. At various times throughout the scene, the actors will need to be at the mirror, the closet (it's a long closet with sliding doors. I'll be getting a profile shot of one of the actors looking into it at the spot I currently have them pictured at here), and going out into the hallway. With so much of the room being shot, and with the room being fairly cramped, I'm very worried about how I'm going to be able to light it and yet still manage to hide everything from the camera. My current idea is to rig up a wall spreader with two diffused lights (I'm thinking two 420w Peppers) aimed in the direction of my actors to imitate the glow of the lamps behind them. 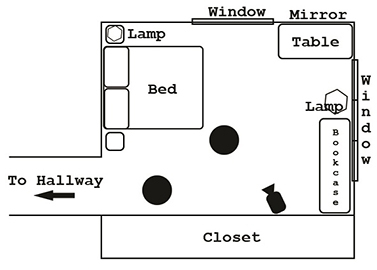 Then I'll set up a light in the closet to provide a little bit of fill, thus suggesting another practical source within the closet, but I'm honestly not sure how good this will look, hence why I'm planning to do some tests later this week. I feel like this is going to be pretty challenging, so I'd be very thankful to hear whatever thoughts or advice you guys might have. Oops, I guess I forgot the floor plan. Here you go. Please, upload the reference pictures you want to show us. I've watched the movie you referenced, but maybe another ones don't. You can use a chinese paper ball lamp (I don't know how they name it in english) and moving near the talents, follow them at the same distance. Take care you don't have spills on the walls, use black wrap to avoid this. I would concentrate on the color of the walls. If they are white in a small room... you maybe doomed. Paunting then to a medium or darker tone would be my first priority. Hey, thanks for the responses, guys. We ended up going with Chinese lanterns after some experimentation, the director even liked the idea of using one as a practical. Unfortunately the space is so limited I can't follow the actors with one. As for the wall color, the walls are fortunately already a warm tone. I'm a bit ambivalent, I kept having a battle with myself of whether to add fill or take it away. In particular I worry that in the shots where she is standing by the bed and sitting down (IMG_3222 and 3225) might be a bit too flat or dark. One thing we agreed on was to put up a few more decorations on the wall so that it doesn't look as boring. One thing I know I'll try is putting some black wrap on the lanterns like Giacomo suggested in order to minimize some of the spill, and I also want to treat the practicals with either ND or Streaks n Tips on the bulbs to take down the blown out look a bit. Does anyone have any critiques or advice for what I have so far? Ok, a good start. But the look is kind of flat. I wouldnt worry about the paracticals clipping. I agree about the flat look, I was having a hard time getting more contrast with the china balls. Tonight I'm going to try putting some black paper on the side of the china ball I'm using for fill and get it off the wall a bit. Bruce, what kind of LED lights do you suggest? I might be able to borrow some battery powered video lights from a friend that I can gel. I think the practical China ball is filling the scene with a good amount of light so I would start by dimming and find a base level for the back. Then worry about the actors. Bruce, really curious about your idea becaus I would never do that! Do you have examples where you did that? Would dimmers work on practical such as lamps? is that the mini panel shown in the reflection? Just curious to see how it looks. Yes dimmers ( or variacs ) work on practicals. Commando cloth might be better to control spill on the paper lanterns. ND works well on the inside of lampshades. Yes, I think it is!